Sambal. Must I repeat myself again. No need right? I think the rest of the sambal dishes can speak for themselves and for you as well (Sweet Potato Leaves Sambal Belacan, Sambal Sotong, Sambal, Sambal Udang & Nyonya Fish Sambal)? What's the cooking story for this Sambal Kentang Ikan Asin? 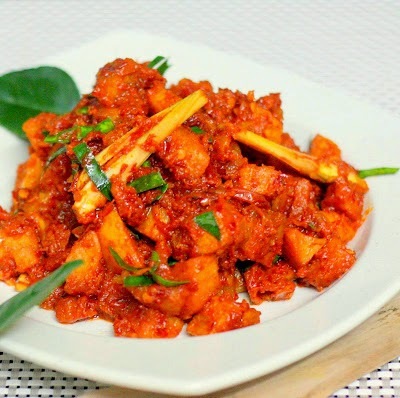 Kentang is potato and ikan asin is salted fish (Pumpkin Salted Fish Curry, Bean Sprouts Salted Fish, Pineapple Salted Fish Curry, Salted Fish Pickle & Salted Fish Mango Sambal). What else should I say? Pretty much nothing much except getting your closer to the recipe. 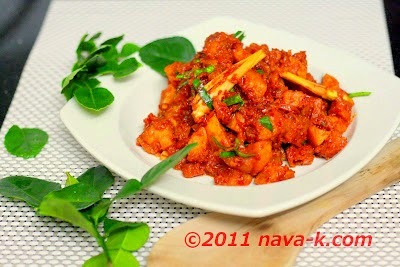 (Spicy Potato Ikan Bilis)? The splendid chillies and kaffir lime leaves and lemongrass scented, spicy our Malaysian Sambal Kentang Ikan Asin. In the same oil, add the blended/grounded ingredients and lemongrass. Stir and fry till aromatic and oil splits. Add in the fried potatoes, fried salted fish and lemon juice. Stir all in together for a couple of mins. Lastly add lime leaves, one good stir and remove from heat. The salt fish and the lemongrass are things that I have been wanting to try. I will need to seek both of these out. Your dish here does have some great elements to it and the preparation method, I am sure, gives it a lot of texture. The first paragraph does have a lot of helpful tips. Well done! You tempting me with another great recipe,Now I need to go to Asian market to see if they have salt fish,,,,Looks so yummy with nasi Putih !! I love salt fish, but have never had it with sambal. Sounds like an amazing combination with the potatoes - I would devour this, but I think my wife would avoid the fish, unfortunately. Your salt fish looks very delicious with that pretty colour from sambal. I am dying to try it. I am sure If I make it my husband is going to ask for seconds. I keep finding recipes for salt fish--I really need to locate a source for it. This looks wonderful! I think I must come halfway across the world so I can sample all these foods which seem ordinary to you, but exotic to me! Another winner, I'm sure! OMG, looks amazing. I love all the flavors, the fish with the lemon grass and kafir leaves must taste yum. Thanks everyone for the support and yummy comments. Appreciate each one of it. This looks amazing! The colors in the dish are spectacular and terrific ingredients...as usual, Nava! nice.. good as appetizer too because of salt fish. love your unique take on recipes!! they are yummy! !